Saturday morning saw Bentley representation across several parkrun venues. At Colchester Castle parkrun Craig Warriner was the first Bentley runner across the line. His solid 19:19 earning him a ninth place finish. Also among those taking on the hills of Castle Park on Saturday morning were Timothy Ballard (24:23) and Andy Stephens (24:55). Recent parkrun 100 Club inductee Paul Hollidge ran his 101st parkrun at Colchester Castle with Deborah Cubberley for company as they took it easy to save themselves for the following day’s cross country race. Debs crossed the line in 28:33 and Paul followed a second later. Finishing one place ahead of Debs with an identical finishing time was Scott Young. In so doing Scott completed his 99th parkrun and is now just one event away from joining Paul Hollidge in the 100 Club. Over at Clacton Seafront parkrun Meera Rajoo-Oakley was the second female finisher, despite being disappointed with her time of 22:54. After all of her hard work in helping to get the event started, Rebecca Conran finally got to try it out on Saturday. Still feeling the effects of the Dublin Marathon, Rebecca finished in 27:17. Staying in Clacton, Kevin James ran a course PB of 22:43. Kevin has run all four events to date and each has been faster than the last. Someone who shares this record is Brian Telford, who ran his third consecutive course PB when he crossed the line in 23:16. Robert Thorpe was the first Bentley runner across the line. His 20:56 performance earned him sixth position. The remaining Bentley representation was made up by Frank Gardiner (23:56), Alison Clarke (29:43), Claire Reynolds (31:57) and Sandra James (34:03). There was also a fair amount of parkrun tourism this weekend. Malcom Jarvis traveled to Great Cornard to take on the flat grassy course for the first time. Malcolm liked the course and finished in 20:39. 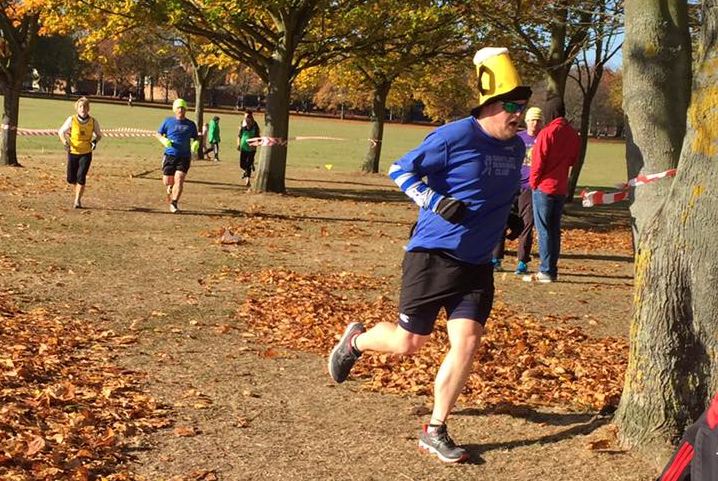 With the 5th November falling on a Saturday Matt Jones decided to make the journey to Gunpowder parkrun. The event is held in Gunpowder Park, a former munitions testing site, but now a country park in Waltham Abbey. Matt finished in 15th position in a parkrun PB of 21:23. Over at Chelmsford Central parkrun John Ferdinand ran the course for the first time and was happy with his 29:19, his fastest parkrun to date. Simon Miller finished the course in 21:06, his fastest time at the event this year. Luke Groves knocked over a minute off of his 5k PB when he finished in 23:33. Opting for 10k over 5 on Saturday morning were Jack Wicks and Louise Upston. They both ran the Queen Elizabeth Olympic Park 10k. Running 53:02 and 62:18 respectively, both enjoyed the race. Ryan Day on his excellent 53-12 debut. Sunday was the start of the cross country season. The first event took place in Abbey Fields, Colchester. This venue was chosen to host the anniversary race that marked 30 years of the North East Essex Sunday Cross Country League. The race was started by Peter Bartlett, who organised the original race 30 years before. All runners who competed in the first race were invited line up for an anniversary photograph. All race finishers received a commemorative bottle of Abbey Fields Ale to mark the occasion. 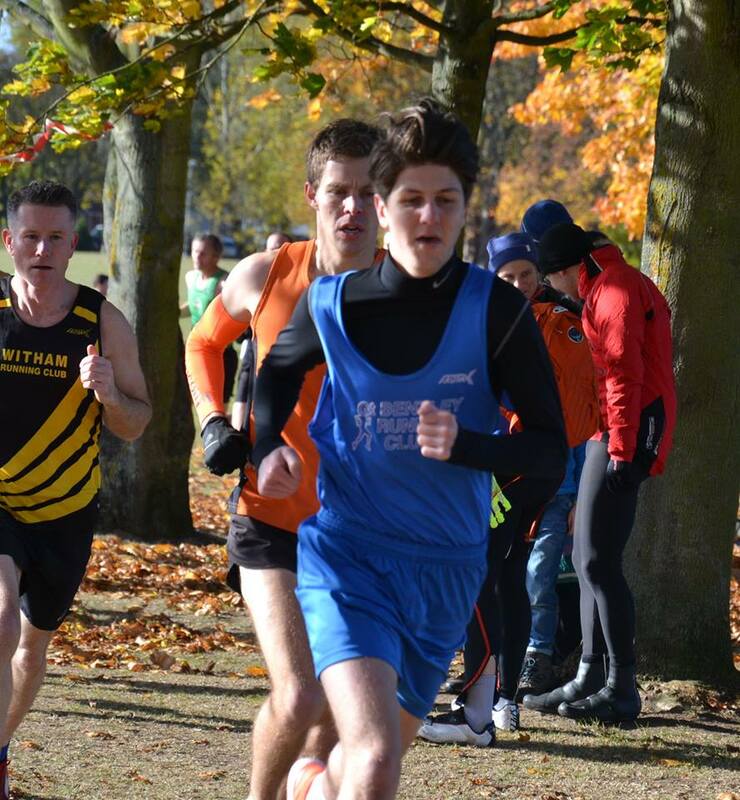 New member and 53-12 Cross-country League debutante Ryan Day ran a fantastic race, finishing in 37th position in the men’s race and second Bentley scorer. Another club member who had a great race was in form runner Luke Groves. Just a day after running his 5k PB, Luke ran an unofficial 5 mile PB, when his watch recorded 43:01. Second PB in as many days – Luke Groves runs his fastest ever 5 miles. There will be a cross country race report written by Matt Knowles which will provide full details of the event. But in the meantime here a brief overview. The men’s team ended the first event with a score of 537. This score was made up of the following scorers: Dave Wright (35), Ryan Day (37), Chris Warren (48), Mark Jasper (73), Ben Ficken (74), Micheal Simmons (81), Matt Laverack (93) and Paul Davidson (96). After one race the men’s league table is topped by Colchester Harriers, with an impressive total of just 62. The ladies’ team finished with a score of 133. The scorers were Vicky Presland (17), Anna Mills (29), Meera Rajoo-Oakley (30) and Jennifer Aylan (57). Colchester Harriers currently lead the ladies’ table with a score of just 18. That concludes this week’s race report. Good luck to all racing in the next week.